Kevin Gaines, 41, of Michigan City, passed away unexpectedly, at 1:11 a.m., Saturday, February 2, 2019 at his home. He was born February 15, 1977 in Plymouth, Indiana to Joseph Gaines and Sandra Lewis. Kevin enjoyed many hobbies including fishing, drag racing, and working on cars. He could fix almost anything. 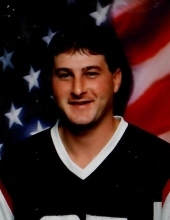 Surviving are his three children, Shelby Gaines, Kevin Gaines, and Dakota Edwards; five sisters Bobbie Jo (Mike) Callahan, Jennifer Lewis, Sarah Lewis, Jessica Lewis, and Diana Lewis, all of Michigan City; one brother, Robert Lewis of Michigan City and his loving companion of many years Tammy Edwards. Preceding him in death were his mother and one brother, Conway Brodbelt. A funeral celebrating his life will be held at 11 a.m., Friday, February 8, 2019 at Lakeview Funeral Home & Crematory, 247 W. Johnson Rd, La Porte, (219) 362-3100 with Pastor Bob Vale officiating . Visitation will be held from 9 a.m. until the time of service, Friday, February 8, 2019 at the funeral home. Burial will be in Oak Hills Cemetery. To send flowers or a remembrance gift to the family of Kevin Gaines, please visit our Tribute Store. "Email Address" would like to share the life celebration of Kevin Gaines. Click on the "link" to go to share a favorite memory or leave a condolence message for the family.